Often, it is just another day. And another of the World “something” day. I come from a country where freedom of speech and freedom of press is something that we take for granted. We do not really think about it. But we are very “vocal” anytime this right is being touched. As I was doing my shopping this morning in Lusaka, Zambia, I became very emotional watching the very small procession of newspaper and radio staff in the middle of the traffic. Marching to promote Freedom of Press. I did not have my phone, so could not take pictures. But I felt with them. To defend the right to free press and freedom of speech. It was small. Only a few people. Traffic was just behind. But they made themselves visible. The band was joyful. People were engaged. And they at least had an impact on someone. Me. 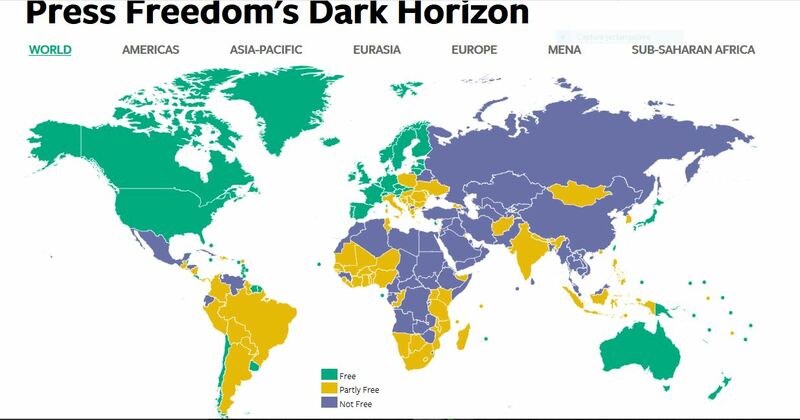 Score for Zambia is 63 in 2017 (ranging from Norway 8; UK 25; France 26 – Zimbabwe 74; China 87; to N. Korea 98), so not that free (actually, under the “not free” countries for Freedom House)… And it is the same in countries around Africa (and Asia, and South America): Not Free or Partly Free. Only a small portion of the world actually enjoys Press Freedom. My emotions overflew when I saw the small procession this morning because it was such a contrast to the memory of January 2015. It brought tears to my eyes. Here, in the middle of the street, holding my shopping bags. It was the thought that, after the attack of Charlie Hebdo 3 years ago, the world came together in a massive procession, throughout France mainly, but in many other places too, with numerous world leaders gathered together in Paris (even named the G50). All in the name of Free Press and Freedom of Speech. And the famous #je suis charlie – #iamcharlie became synonymous of Freedom of Press and Freedom of Speech. Yet… this one day, today, to celebrate Freedom of Speech, Freedom of Press since 1993, is mostly going unnoticed. It takes terrorists to remind us of this freedom. And then we forget again. Including me. A couple of illustration of the many many reactions in 2015.